I first had the pleasure of meeting Kaye when I planned her brother’s wedding in New York City a few years ago. When Kaye and Gabe asked Ted Martinez Events to plan their dream wedding, I was beyond excited—I love those occasions where I can work with clients and their families throughout the years, planning their most cherished life events and as such, become a part of their network of family and friends. 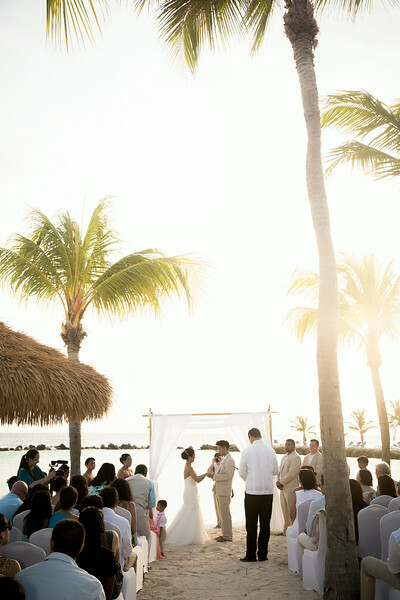 This special couple dreamed of a destination wedding in beautiful Aruba, where their celebration could be held in a mesmerizing setting with a secluded and intimate feel. Looking to provide their guests with a memorable weekend of equal doses of relaxation and fun, Gabe and Kaye ultimately decided on Aruba Private Island, a beautiful palm tree encrusted island with private white sand beaches dotted with rosy flamingos. Crisp whites and warming sand tones set the tenor of the party, allowing the celebration space to meld flawlessly with the beautiful, natural backdrop. My team and I worked closely with Kaye and Gabe to design their three-day celebration. 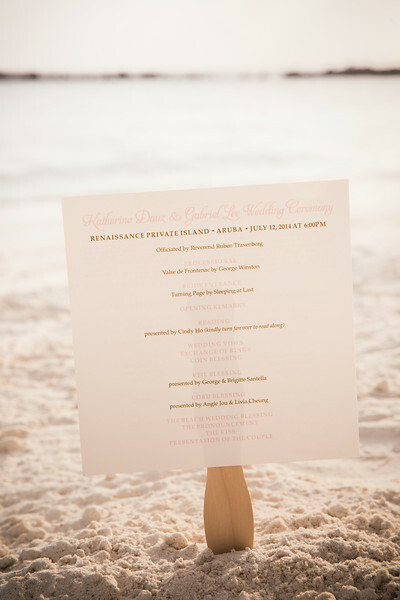 We incorporated a catamaran excursion into the wedding itinerary, which thrilled their lucky guests, and planned a delectable post-wedding brunch on the beach. To get the party started, I arranged for a catamaran to transport the guests to the wedding space, while the bride and groom traveled to a secluded oasis located elsewhere on the island where they could spend a few special moments taking in their “first look”. This magical instance was witnessed by the bridal party, all of whom arrived at the private island by private speed boat and at the “first look” by coach bus. Kaye and Gabe have beautiful cultural backgrounds and throughout the planning process, we knew we wanted to incorporate this aspect into the wedding space and ceremony in a special and fun way. We decided to “wow” the guests with a surprise Chinese lion dance, beachside under the stars. The golden glow of this traditional lion delighted Kaye, Gabe and their guests and added another element of magic to the celebration. 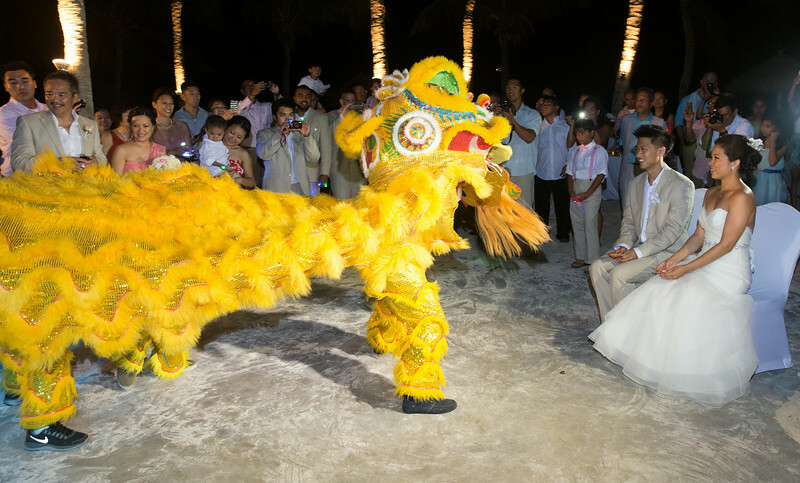 In addition to the Chinese lion, we incorporated Filipino traditions into the wedding ceremony, ultimately creating a stunning synthesis of Filipino and Chinese ethnic traditions in a Caribbean paradise. My team and I pride ourselves on flawlessly planning and executing even the most intricate logistics. For example, the exciting and varied forms of transportation that both delighted and assisted Kaye, Gabe and their guests required exceptional planning and attention to detail. It’s not every wedding that has a party bus, catamarans and speed boats! I personally oversaw this transportation, together with every other detail of the wedding, ranging from the timely entry of the Chinese dragon to the rolling out of the crisp white cake (an event whose timing is particularly important in an outdoor tropical atmosphere). I am passionate about telling the love story of my clients through the nuances of their wedding celebrations. Gabe and Kaye’s wedding was designed to be a reflection of their individual heritages and a celebration of those heritages coming together in a manner indicative of the couple’s personality. The newlyweds were able to sit back and enjoy the wedding of their dreams, confident in the knowledge that all of the special details of their joyous event would be taken care of. In the words of the bride, “Ted and his team were with us every step of the way to ensure all aspects of our special occasion were taken care of . . .[we are] waiting for our next special event so we can use Ted Martinez Event Management Team once again”.